The outer box of the retail packaging is absolutely covered in images and details related to the items found inside. You get a very good look at the headphones from a few angles, and plenty of details regarding what they will offer you in terms of audio performance. Inside is a hot pink box that looks like it was for some sort of luxury gift item. 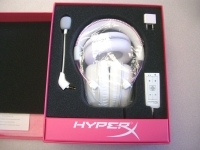 In addition to the eye popping color pallet, the box is very thick and opens like a gift box to reveal the headphones and accessories. 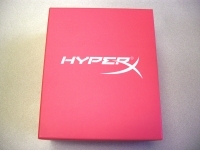 Black foam is custom cut to fit the bulk of the items, while the slim pink HyperX box at the bottom houses a few more goodies. 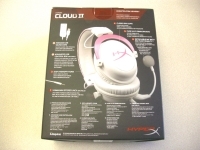 At this point I would guess that the packaging alone cost more than most of the headphones I have ever owned. That comment may reveal me as being far from a high end headphone expert, but the packaging really is well done and high quality. The image below shows everything you will find in the box. 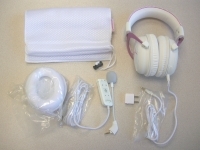 There is a mesh carrying bag with drawstring closure, the Cloud II headset, a replacement set of ear pads, the USB cable / controller, the boom microphone, and an airplane adapter. 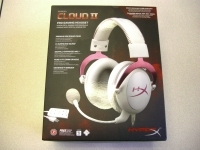 The extras really are all nice touches and should make the Cloud II headset useful in far more settings than just for PC gaming. The carrying bag is nice since it is oversized, giving you plenty of room for all the accessories plus the headset. I just might want something more rigid in order to protect my $100 investment while on the go. 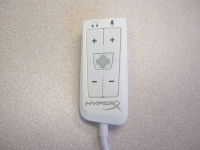 The images below show the USB controller and extension cable. 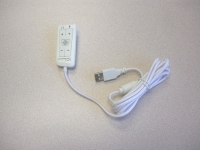 This item is for use with Windows PCs only, and eliminates the need for a sound card in your system. All audio processing is done by this device, providing 7.1 channel surround sound to the headset, while also enabling the microphone. As you can see from the controller's face, you have the ability to adjust microphone and speaker volume independently, as well as a button to toggle the 7.1 channel surround. While these controls do give you the basics, it would be nice to have a Windows based interface for fine tuning the audio to your personal taste. 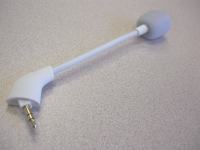 The below right image shows the boom microphone, which simply plugs in to the base of the left ear cup when you want to use it. 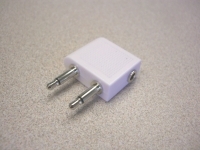 The below right image shows the airplane adapter, which will let you save a few bucks when you fly and keep you from having to use those terrible airline headphones. 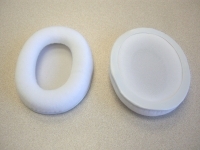 The last image in this section shows the replacement set of ear pads. The set pre-installed on the Cloud II headset are made of synthetic leather, while the replacement set if made from cloth. They both seem really comfortable, but I prefer the feel of the "leatherette" set. The cloth ones may breathe better and stay cooler, but I can imagine them getting grungy really fast.